Papa Keith recently began using his platform to promote causes he cares about. With school out, kids' camp has begun at Charles Hadley Park. 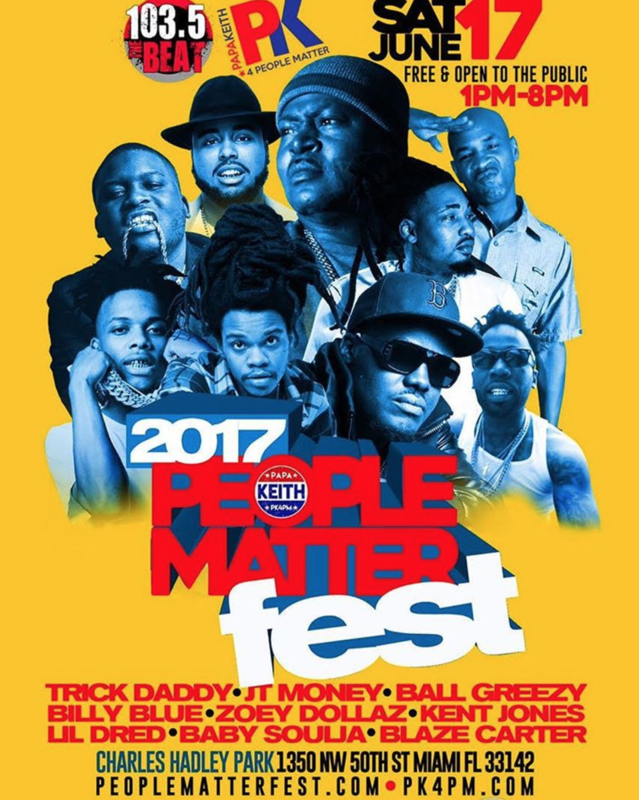 His most recent undertaking is the People Matter Fest, a free event originally planned for Charles Hadley Park, 1350 NW 50th St. in Liberty City, that was expected to feature several hip-hop artists including Liberty City native Trick Daddy. HPNA President Samuel Latimore says he didn't know about the festival--which was scheduled to take place in his neighborhood--until he saw the flier. The festival is part of Walcott’s campaign, “Papa Keith 4 People Matter,” or PK4PM. He says he launched PK4PM when he realized success and popularity weren’t making him happy. “I felt empty, and I didn’t understand what that was about,” he says. He decided he needed to start using his platform to promote causes he cares about. As part of a campaign to get out the vote last year, he interviewed former President Barack Obama and former Secretary of State Hillary Clinton. He continues with PK4PM largely through social media. Twice a week, he features interviews with entrepreneurs of color and community activists on Facebook live. But he wanted to do more. “I’ve been to a lot of festivals and shows in South Florida: hosting them, being a part of them, witnessing them. And I was saying, ‘Wow, there’s really nothing for the kids,’ nothing they can relate to, artists they want to see, ...in the same kind of festival setting,” Walcott says. So he planned a festival. It would be free and open to the public. Along with hip-hop performances, there would be a basketball tournament, food and a kids’ play area. In partnership with City Commissioner Frank Carollo’s office, he declared a 24-hour cease fire around the event, calling for a halt to gun violence in Miami. Walcott also got support from City Commissioner Keon Hardemon for the festival. He gathered sponsors and promoted the event on social media. It wasn’t until after the festival was being advertised that members of the Hadley Park Neighborhood Association heard about it, and it took them off guard. Inadequate space for parking was among HPNA President Samuel Latimore's concerns. 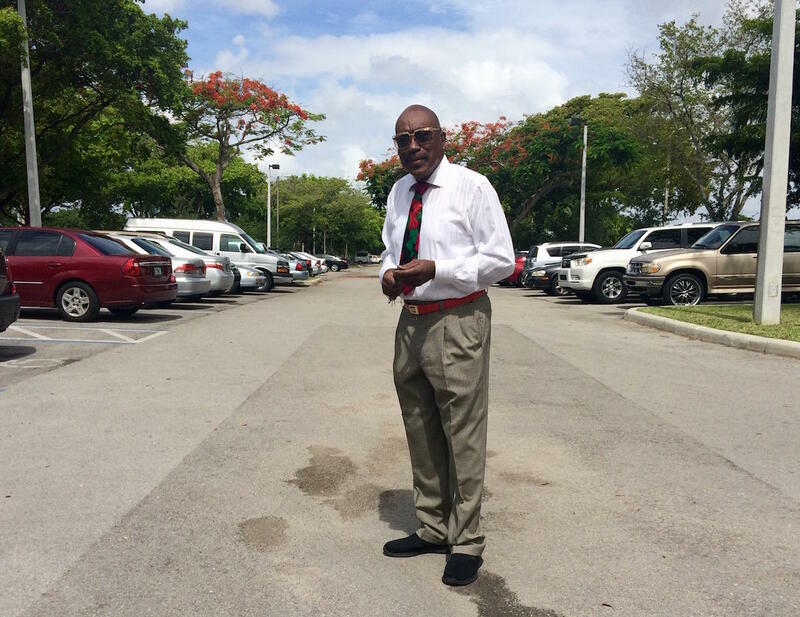 Latimore is a retired Miami Dade College professor specializing in criminal justice. He lives in the same house his parents bought in Liberty City. He says he had trouble getting an exact number of how many people were expected at the festival. He says he was concerned about parking capacity and whether there were enough entrances and exits to the park. He also mentioned shootings earlier this year at Martin Luther King Jr. Memorial Park after a parade honoring the civil rights leader. Walcott says those concerns were part of his motivation to hold the festival in the first place. Walcott says that due to the community's concerns, he decided to move the event east of I-95 to nearby Athalie Range Park, 525 NW 62nd St. He says police stipulated that the event there be shortened by two hours and the artists will be removed from the program. The Miami Police Department declined to comment for this story. The board of the HPNA agrees with Latimore, as do many community members who frequent the Carrie P. Meek Senior and Cultural Center in Charles Hadley Park. But not everyone was opposed to the festival. “I thought it was a great idea,” says Stacey Dean, a kindergarten teacher and receptionist at the Meek Center. She says kids were enthusiastic when they saw the fliers. The festival in Athalie Range Park Saturday is expected to feature a kids’ zone, basketball, a DJ battle and food vendors, but no live hip hop performances. 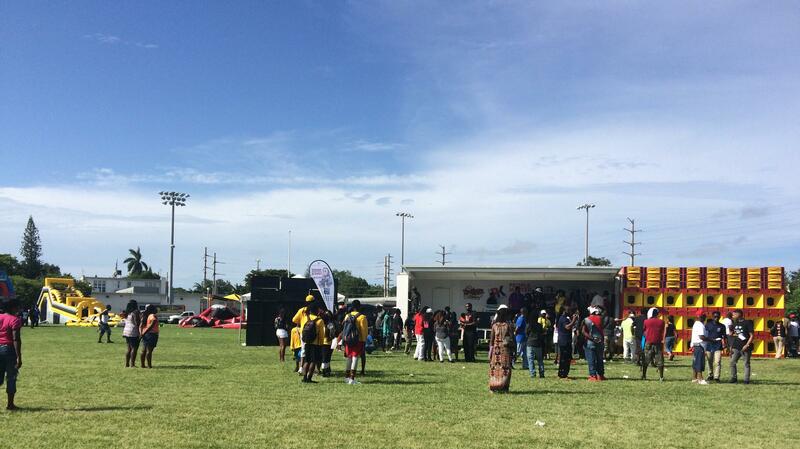 Hundreds came out to Athalie Range Park on Saturday for the People Matter Fest. Kids ran around barefoot from one inflatable obstacle course to the next, face paint running down damp foreheads under the sun. People lounged on bleachers facing the stage and sampled food from food trucks parked in the parking lot. Bass could be heard around the neighborhood. "The only issue we had was the sun was too hot," said an energized Papa Keith. He said in a couple of months, it'll be time to start planning for next year. 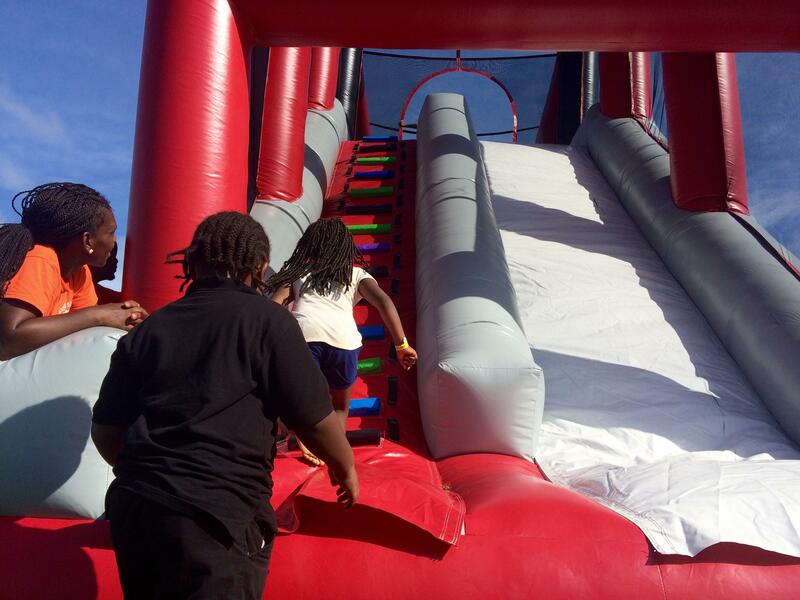 Kids played for hours on pop-up obstacle courses as part of the People Matter Fest in Range Park. This one leads to a 10-foot jump into a giant inflatable cushion. There were no live performances, but DJs still played music on stage. Bass could be heard around the neighborhood. Papa Keith poses with a "Certificate of Appreciation" from Commissioner Keon Hardemon's office and the City of Miami. A week after Louissita Chery brought her newborn baby home, he started to have trouble breathing. She rushed him to the hospital where he would remain for a month with respiratory problems. What are you reading? WLRN wants to know — and we'll share what we, and other people in the South Florida community, are reading every week in this space.